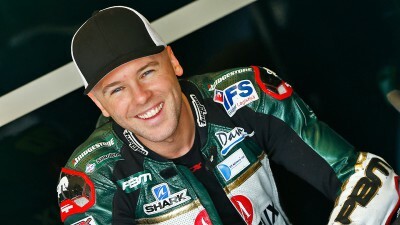 PBM, with MotoGP™ riders Yonny Hernandez and Michael Laverty (pictured), will be heading to the English county of Yorkshire later this month in order to take part in the annual ‘Night With The Stars’ chat show. The chat show is organised by the North Yorkshire Road Racing Supporters Club (NYRRSC), taking place in the market town of Northallerton. The event will be staged on the evening of Tuesday 27th August - on the run-up to this year’s Hertz British Grand Prix - as Hernandez and Laverty are joined by other Paul Bird Motorsport riders, such as British Superbike champion Shane Byrne. "The NYRRSC does a fantastic job in helping raise funds for local racers, so we are only too pleased to come along and support them," says Team Principal and owner Paul Bird. "We do very little in the way of these types of functions but this is one event we have promised to support as a whole team and to have a bit of fun, so hopefully there'll be a good turnout on the night." The evening will be underway from 8pm local time (GMT +1) at the Golden Lion Hotel on Northallerton High Street. Admission costs £5.00 per person (£4.00 for NYRRSC members) and, as well as the chat show, there is a bar, raffle and auction for memorabilia.